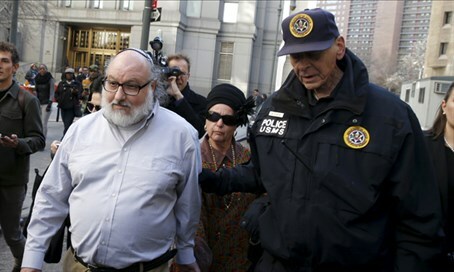 Parole board decision prevents Pollard from attending synagogue, or enjoying a Sabbath meal with relatives or friends. Eliot Lauer, who serves as attorney for freed spy Jonathan Pollard, revealed Monday that the parole board has determined that Pollard is to remain under a house curfew lasting from 7 PM to 7 AM every day. He will also wear a GPS bracelet that will monitor his location at all times, and his movements will be limited to a small area inside New York City. His computers at home and work will be monitored as well. The curfew means that Pollard will not be able to take part in synagogue prayers that take place after 7 PM or before 7 AM, and that he will not be able to enjoy Sabbath meals or other festive meals with relatives or friends. The relatively small radius in which he may move about also makes it difficult for him to find employment. The employer who accepted Pollard for work as an analyst announced over the weekend that he is taking back his offer because the government's insistence on monitoring Pollard's computer would compromise his firm's data privacy. Pollard is also obligated by the terms of his parole to answer the phone and open the door at all times, day or night, since the probation officer could carry out surprise inspections at any time. Pollard's lawyers have filed a federal court motion against what they say are the "unjustified and illegal" conditions of his parole. They noted that he poses no danger of recidivism and any intelligence information he still possesses is 30 years old and irrelevant. The activists for Pollard have asked Israeli ministers and MKs not to speak about the conditions of his release because of the "sensitivity" of the subject, and to let his lawyers handle the matter.